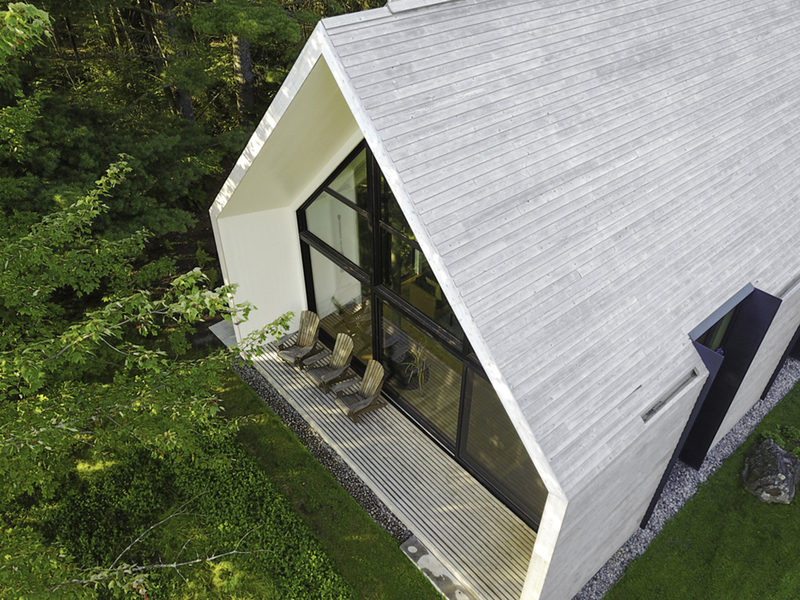 Between a clearing of trees overlooking Lac Plaisant in Mauricie, Quebec sits Window On The Lake, a modern cabin designed by Architectural firm YH2. 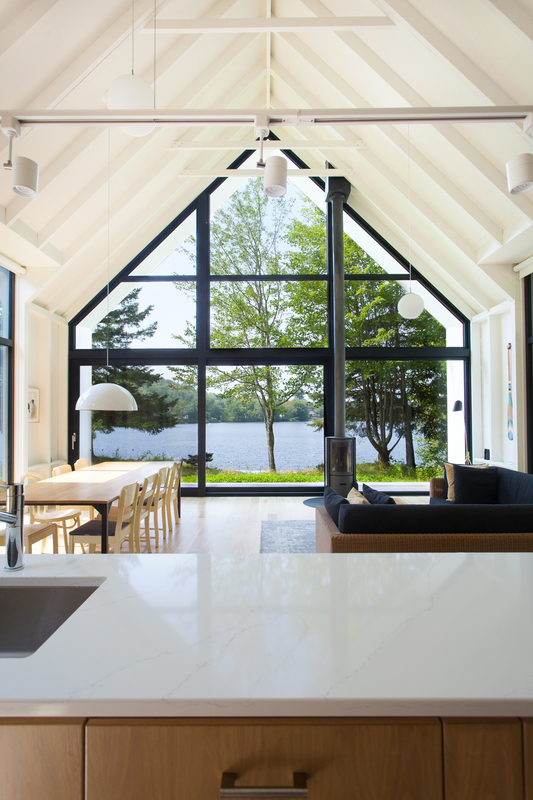 Surrounded by a dusting of wildflowers and dense forest, this clean-lined dwelling embraces a setting highly coveted by Canadians - a private sanctuary on a fresh water lake! The project's design and recurring theme of balance exceeds my wildest dreams, with its artful marriage of space and light. 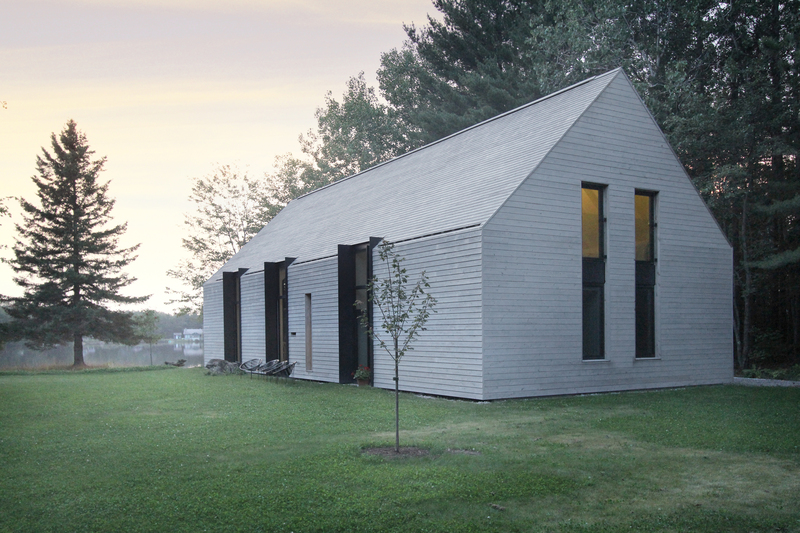 On the home's longest sides the gable is flush with the structure, as is one face, and on the end facing the lake a steep overhang wraps the stunning volume. The overhang offers the terrace and substantial glazing protection from the elements. Clad entirely in white-washed cedar, the volumetric design of the structure contrasts with the bucolic landscape, creating visual interest. Inside, the geometric fenestration artfully frames the lake and a small deciduous tree which is centred perfectly in view. 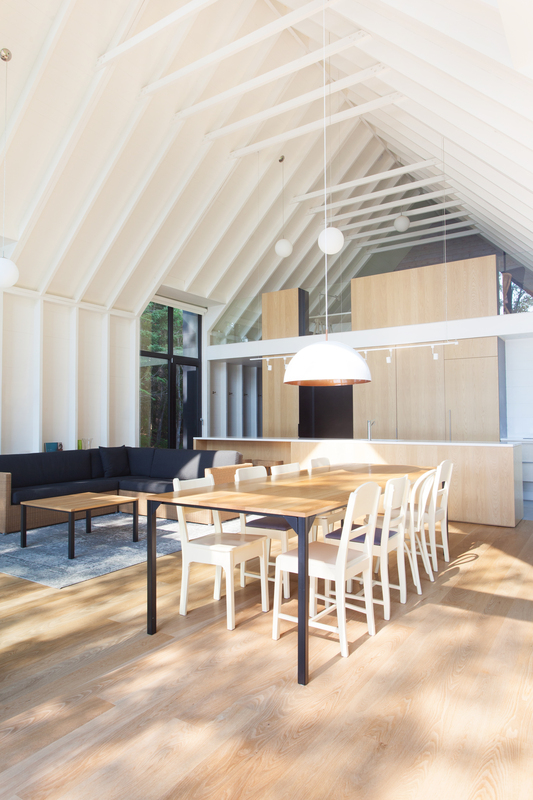 The cool white walls of the structure are offset by black window casings which direct the eye to the view, bringing the outdoors in. Exposed beams and cross-ties that both refract light and cast shadows introduce an architectural rhythm to the interior. This gradient effect runs the length of the home - thus creating depth. I'm particularly drawn to the yin-yang harmony of the contrasting tonal palate. The predominance of blacks and whites are balanced by the texture and tone of natural wood, grounding this Great Room with its verdant vista. A pure subscription to symmetry is evident both inside and out, creating strong focal points and a pleasing spatial balance. I especially admire the attention to detail with the stairwell above. 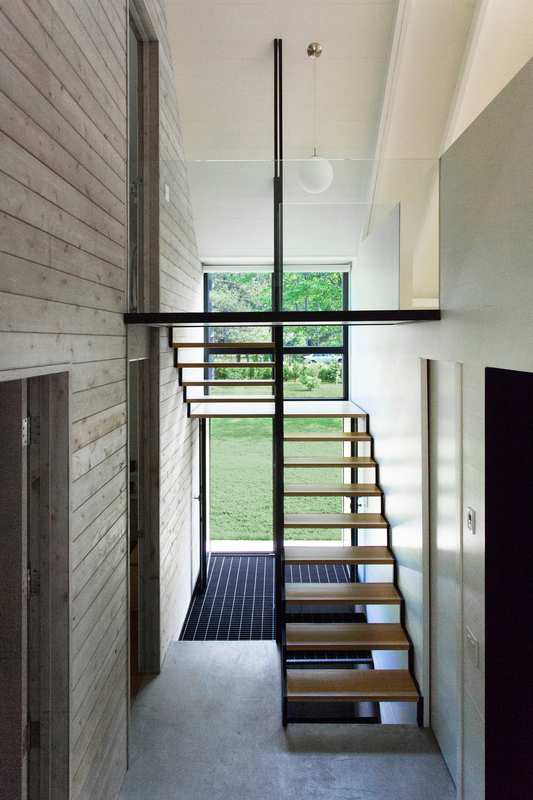 Framed by expansive glazing and doors, a floating wood and metal staircase with a strong horizontal presence looks sculptural, rising to a second floor landing encased by (almost) invisible glass railings. A black metal grill anchors the entrance and landing to the lower level, continuing the subscription to transparency while defining its purpose. It provides thoughtful utility while reading as structural art. 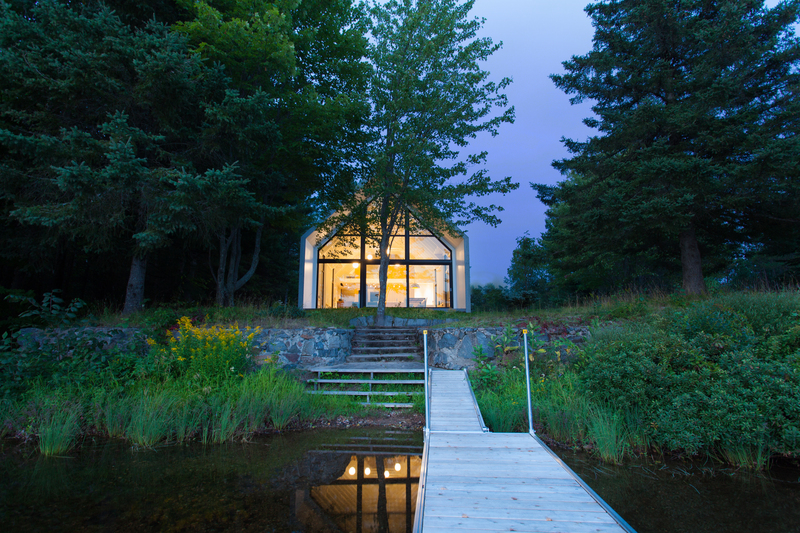 YH2's Window on the Lake reinterprets the Canadian cabin vernacular in a modern language. Hinting at the past yet decidedly forward-thinking, this sanctuary of proportion, balance and scale harmoniously embraces its lakeside setting. To see the firm's full portfolio including other stunning architectural projects, be sure to check YH2. This article was researched and written by Amanda Salmon - A Bachelor of Fine Arts graduate from the Alberta College of Art and Design.